Edited by: Echol Nix Jr.
Foreword by: Hugh M. Gloster Jr. In the Beginning highlights the history of the world’s largest religious memorial to the legacy of Martin Luther King, Jr. Inspired essays on education, social justice, nonviolence, peace, ecumenism, and civil and human rights are offered in honor of Lawrence Edward Carter, Sr., founding dean of the Martin Luther King, Jr. International Chapel. This book is a lasting tribute and valuable contribution to the history and educational mission of Morehouse College. Contributors include Lewis V. Baldwin, Thomas O. Buford, Delman L. Coates, Jason R. Curry, Norm Faramelli, Peter Goodwin Heltzel, Barbara Lewis King, Douglas E. Krantz, Bill J. Leonard, Otis A. Maxfield, Echol Nix, Jr., Harold Oliver, Peter Paris, Samuel K. Roberts, Prince El Hassan bin Talal, Harold Dean Trulear, Edward P. Wimberly, Vincent L. Wimbush, and Virgil Wood. 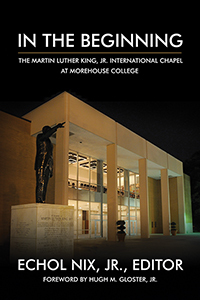 A superbly compiled and edited selection of informed and informative essays, "In the Beginning: The Martin Luther King Jr. International Chapel at Morehouse College" is an inherently absorbing read. Of special note is the concluding essay "A Biography of God's Dream" by Virgil Wood. A truly memorable body of insightful scholarship and an impressive tribute to Morehouse College, "In the Beginning" is very highly recommended for personal reading lists and academic library collections.